Let's see. 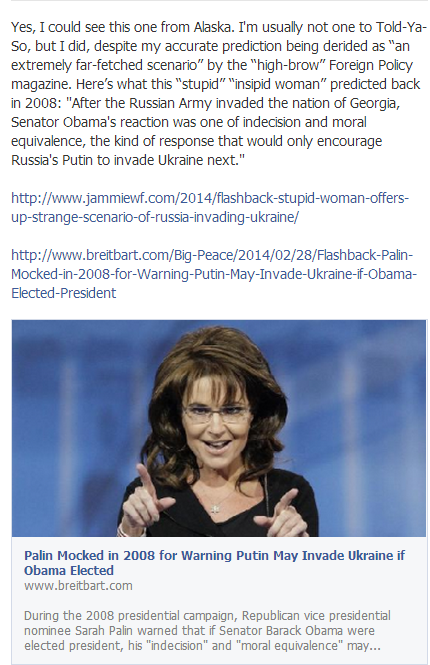 While campaigning in 2008 she warned that Putin would seize Ukraine if Obama got elected. Well, Obama did get elected. And Putin waited till 2014 because...election results from the last two general elections had not reached Russia? Why couldn't she have shouted it out from Alaska, after all you can see Russia from that state. Oh wait, the grifter is in Arizona these days, right?